There has been a Significant Height Revision to a hill that is listed in The Fours initiated by LIDAR analysis conducted by Myrddyn Phillips. The Fours is the title for the list of 400m hills of England and is co-authored by Myrddyn Phillips and Aled Williams with the 2nd edition of the booklet containing this list published by Mapping Mountains Publications on the 24.04.18. The Fours - English hills at and above 400m and below 500m in height that have a minimum 30m of drop. The name of the hill is Tindale Law and it is situated in Region 33; Scottish Border to the River Tyne, and is positioned overlooking the River Coquet which is to its west, north and east and has the small community of Barrowburn towards the east. As the hill is not a part of designated open access land permission to visit should be sought, for those wishing to do so a public footpath crosses near to the critical col and the summit is then only a short distance to the north. 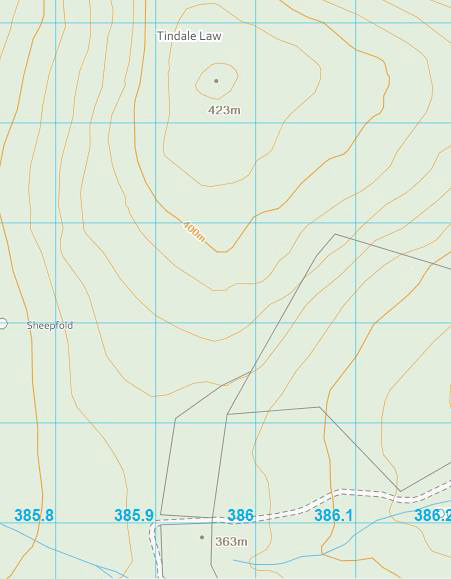 Prior to LIDAR analysis this hill was listed with 60m of drop based on the 423m summit and 363m col spot height that appear on the Ordnance Survey Interactive Coverage Map hosted on the Geograph. 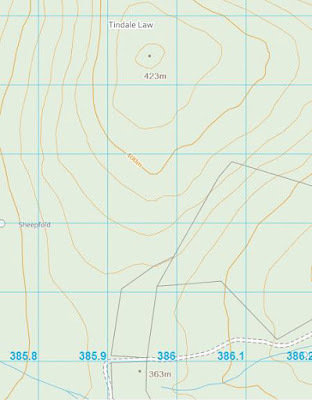 The term Significant Height Revisions applies to any listed hill whose interpolated height and Ordnance Survey or Harvey map summit spot height has a 2m or more discrepancy when compared to the survey result produced by the Trimble GeoXH 6000 or by LIDAR analysis, also included are hills whose summit map data is missing an uppermost ring contour when compared to the data produced by the Trimble or by analysis of LIDAR. As heights on different scaled Ordnance Survey maps are not consistent the height given on the 1:25,000 Explorer map is being prioritised in favour of the 1:50,000 Landranger map for detailing these revisions. Therefore, this hill’s new summit height is 421.0m and this was produced by LIDAR analysis, this is 2.0m lower than its previously listed height of 423m which appears as a spot height on the Ordnance Survey Interactive Coverage Map hosted on the Geograph website.